Joey is now now four months old and 20pounds. He is a very good boy, following his mentor Simba, who is right next to him, as usual. You can see a bit of his fur. The girls are playing with him too, and Joey learned already how to share his toys. Simba is the perfect big brother, gentle but firm if it comes to pack discipline. This is ther favorite play. Oh my goodness look at that face! So adorable. Thanks for sharing. He is a cute guy everyone likes him and so far he is very social. No growling at strangers and he likes to be touched. Might change still when he becomes a teenager but it's a good start. Pinoy51 wrote: He is a cute guy everyone likes him and so far he is very social. No growling at strangers and he likes to be touched. Nice to know that. I'm glad, you don't have problems with this cute gut He is soo sweet. Joey is getting 5month soon. Became watchful but didn't loose his affection for water. I haven't seen him dru for more than five minutes. The breeder was right he is very headstrong. Every now and then we have an argument about the house rules. Simba isn't helping much either anymore, he let him be and is looking at me to enforce the pack rules. Also food aggression isn't solved yet but he already respects the food of the others. Work in progress but already a great additon to our pack. How many is that Pinoy? not sure if I understand the question correct, but our pack has seven members. Four Chows and three mixed breeds. Actuall six plus one would be more correct, as one of the mixed guys likes to live independent. He befriended a tom cat and stays in another area of the house than anybody else. Lol, great response. And yes that was my question. I knew you had a good sized pack. More than I could deal with and we are at 3. There are two indoor cats and the stray tom cat ( the friend of Teddy our free spirit) as well. I haven't posted about Teddy as he is mixed, but maybe I will post a picture of him and his cat friend one day. just for fun. It is not as much work as it sounds. The six dogs are very stable, we feed them all together and then they go their ways during the day. We spend the evenings together and at 10 p.m. they go their sleeping places. 7 a.m. the next day starts. 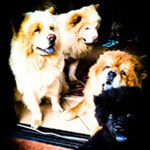 I can bring the four Chows in a car, they sit in the back and enjoy the ride. Never planned to have that many. After we got Simba I decided to get Nala, so Simba would have a girl friend in similar age. Sally was a rescue, I couldn't reject her and Joey in the wrong hands would become one of this aggressive Chows people talk about. So i took him as well to prevent him ending up in a cage getting crazy. But now we have to stop, otherwise the spaces in and around the house becoming too small and aggression might build up.